If you’re spending New Year’s Eve in New York City, celebrate in style on this New Year’s Eve cruise with views of the NYC skyline and fireworks! 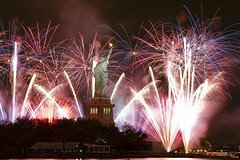 As the clock strikes midnight, your boat will be in perfect position in New York Harbor to watch the fireworks erupt over the twinkling city. You can also ring in 2015 as you watch the ball drop in Times Square on one of several 42-inch plasma televisions with a Bose sound system that will make you think you’re in the middle of Times Square rather than floating through the peaceful New York Harbor. As the clock strikes midnight, witness first-hand as the legendary New York Harbor transforms into a center stage encompassed by a magnificent skyline, filled with breathtaking pyrotechnic display to ring in the new year. New York City is the New Year’s Eve destination and a party aboard the boat is the place to be! Enjoy an open bar of beer and wine as you admire views of the Lower Manhattan skyline, and world-famous landmarks Ellis Island and the Statue of Liberty. Sample savory hors d'oeuvres and have fun showing off your moves dancing. Work up an appetite and feast on the delectable dinner buffet. Playing all night on large TV is coverage of the New Year's Eve festivities in Times Square. At midnight, watch the spectacular fireworks show!